From the access along the gully to the beginning of the dihedral A/B. Short traverse up to the end of the dihedral C/D and along a grassed ledge towards the pine A/B. Past the pine on a steep grassed ledge and a short rock step beneath an overhang to the rock register A/B. Up to a ledge A/B and continue up to a niche B/C. To the left traverse an exposed crossing, over ledges and steps to the beginning of a short gully-like ramp to the right B/C. Over a few rock steps to the left into the gorge-sided wall. Past rock slabs and ledges to the rope climb crossing the gorge and towards the end. Continue for 10 minutes along the walking path to the summit. Duration: approx. 2 hrs, climbing length approx. 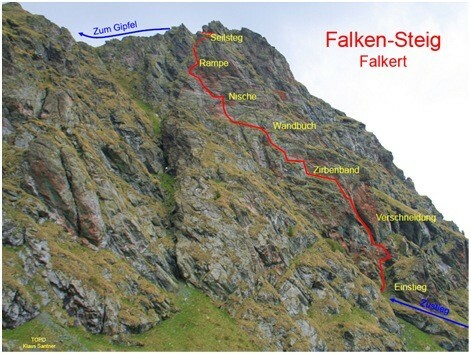 300 m. Descent: along the marked path back to Lake Falkertsee – approx. 60 min. Use of the via ferrata at own risk!